Events over the course of the last six months – most notably those surrounding the riots in Ferguson, Missouri in August – have once again given rise to urgent discourse on race relations in the United States. As though fated, into that charged atmosphere comes Ava DuVernay’s Selma (2014), a stirring and complex portrayal of three civil-rights marches that took place in 1965 between the eponymous Alabama town and nearby state capital, Montgomery. The demonstrations were intended to force through legislation on voting rights and were spearheaded by Martin Luther King Jr himself, perfectly embodied on-screen in a towering performance by a transformed David Oyelowo. 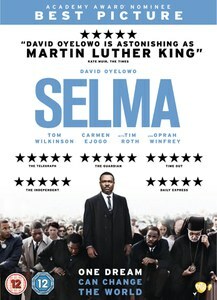 Refusing to pull its punches, the opening scenes set the tone for what is to follow: King shares a tender and melancholy moment with his wife, Coretta (Carmen Ejogo), backstage before the presentation of his Nobel Peace Prize; four young girls are killed in a shocking racially-motivated bombing in Birmingham, Alabama; Annie Lee Cooper (Oprah Winfrey) is denied her vote. It’s a perfect reduction of the proceeding film’s key thematic and stylistic concerns. Unfussy in its construction but classically beautiful to behold, Selma is not a Martin Luther King biopic per se. Instead, it’s a vigorous and emotional corrective against ingrained and institutionalised racism. DuVernay’s film is also a subtle and effective insight into the conflicts both within and without civil rights activism and King himself. Best known for his oratory, Oyelowo has perfectly captured King’s familiar cadence and he delivers both sermons and calls to arms with forceful fire. It is not in the rousing speeches that either actor, or film, truly soars though, but the moments of silence. For every precise and moving word, there is a flicker in the eyes or an instant of quiet contemplation that paints in far richer detail. Although his inner demons are externalised at times, it is the pauses through which Oyelowo and DuVernay seek to sketch the weight and cost of King’s ongoing battle. In single beat they convey everything from painful remorse to clenched frustration or momentary reprieve. As King and his cohorts arrive in Selma intending to stir up the populace and outmanoeuvre a stalling Lyndon Johnson (Tom Wilkinson), the lines are drawn. The primary opposition – encapsulated in Tim Roth’s loathsome governor – may be binary, but parlays must also be agreed with both militant activists like Malcolm X (Nigel Thatch) and the young, mobilised black residents of Alabama. Likewise, King struggles to reconcile himself with the violent retribution (for his non-violent protests) that he relies upon from the establishment. His stall is set and his cause is just, but DuVernay and screenwriter Paul Webb want more than a summary reading of events and their ethical ramifications. When the levee does finally break, it does so in unflinching scenes of chaos and terror. It’s brutal, desperate and enraging. It casts Selma as a vital and timely missive to a new generation that is as sobering as it is uplifting, all built around a performance of astounding accomplishment.